Welcome to A Beautiful Backdrop in Pigeon Forge! 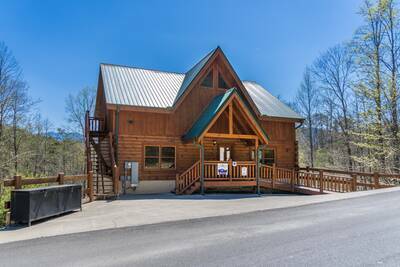 This spectacular 4 bedroom, 3 bath Smoky Mountain cabin rental has all of the features and amenities your heart desires for an unforgettable vacation getaway. Here at A Beautiful Backdrop, you’ll love the sweeping Smoky Mountain views from the mountaintops, all the way down to the valley floor. The beautiful and spacious living room features a cathedral ceiling with exposed beams, wood burning fireplace with stove insert, flat screen TV, access to the open and deck and the screened porch, and luxurious upscale furnishings and décor. Adjoining the living room, you’ll also notice the beautiful fully equipped kitchen, complete with solid surface countertops and a nearby dining area where you can enjoy a delicious meal with your friends and family in the Smokies. 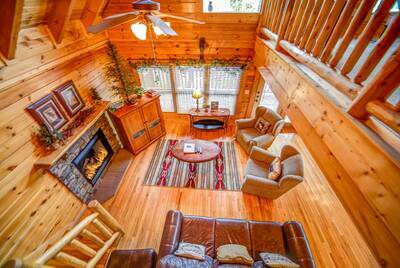 On the main level of this stunning Pigeon Forge cabin rental getaway, is the impeccable master suite. Here you’re treated to a custom-made log kind bed, flat screen TV, and a private full bath with a soothing jetted tub. Venture upstairs and you’ll enter the spacious loft bedroom. This relaxing room features a custom log queen bed, flat screen TV, full bath and a wonderful office space, perfect for those needing to do a little work while vacationing in the Great Smoky Mountains. Down on the lower level of A Beautiful Backdrop, you and your special guests will find the recreation room, complete with a pool table. Adjoining the recreation room is a second living area with a 65” flat screen TV, fireplace, and deck access. Also, located on the lower level, you’re treated to a full bath plus an additional bedroom with custom log bed and flat screen TV. Don’t worry, we didn’t forget the little ones at A Beautiful Backdrop. 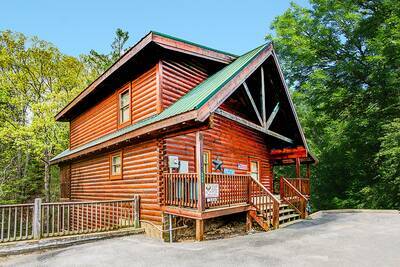 This Pigeon Forge cabin rental offers their very own private bunk room. A Beautiful Backdrop features wonderful outdoor space, with mesmerizing Smoky Mountain views at very angle. The main level offers an open deck with patio table and addition seating, and there’s also a relaxing screened in porch with rocking chairs located here as well. On the lower level of this cabin getaway, you’ll find the large 6 person outdoor hot tub (with breathtaking views) and comfortable seating. 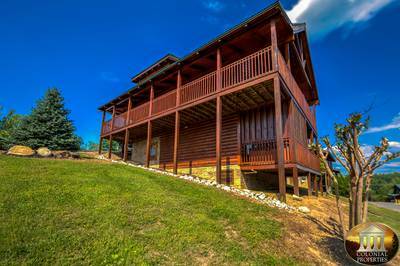 Life doesn’t get much better than when you’re staying at this Pigeon Forge cabin rental. With awesome mountain views, luxurious features and amenities, and 3 levels of spacious living space, you and your guests are in for a real treat when staying at A Beautiful Backdrop. 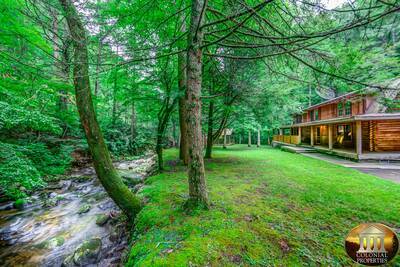 Plan your Smoky Mountain vacation escape here today! A: It has a private bunk room for the kids. A: It has 3 parking spaces. A: Hi Cassie! A Beautiful Backdrop is located in beautiful Wears Valley, it is approximately 20 minutes to the Cal Ripken Experience. A: A Beautiful Back Drop is located in beautiful Wears Valley. The drive to Gatlinburg would take approximately 30-35 minutes. A: Hi Paris! Check-In time is anytime after 4PM EST. A: Hi Nathan! Yes it is. “ Cabin was very nice - clean - and great for our family gathering of 9. “ Cabin was great. Spacious and clean! “ We had a wonderful time! The cabin was beautiful, and the rental contacts were very helpful and friendly whenever we had questions. The cabin seemed to be really far from town when we arrived, but as with any location, got closer as we got used to the distance. We are looking forward to booking this cabin again. “ We enjoyed our stay At Beautiful Backdrop. “ Absolutely amazing!! We a loved the cabin, and enjoyed our time with the family. “ Had the time of my life with family! “ If you are looking for a perfect place to stay, you will not be disappointed with this cabin. We had a very relaxing vacation. “ We were so pleased with this cabin. It was everything we hoped it would be and more! We will certainly will be back for many more stays.